The IMD has announced that a "east -west shear zone " is establishing over the south peninsula by the weekend. This is the indication that the North -East monsoon is approaching. In fact, when a circulation gets embedded in a shear zone, it provides a good momentum to the monsoon to strenghten. The ECMWF, has, infact predicted a formation of a circulation in the south-west bay, as indicated in my blog, yesterday. Another circulation is predicted in the south -east Arabian Sea. If they materialise, two circulations on either side of the shear zone can give a good momentum to the North-East monsoon. IMD today announced the widhrawal line of the South West monsoon as passing through Aurangabad/Dahanu (20N), on the western side . The western side declaration seems to be slow, to me. The widhrawal is way below Maharashtra, I feel. The situation so demands, as 1. the north-east monsoon is gearing up. 2. the humidity levels are low right upto peninsula India(map) 3. the anticyclone has effectively pushed the north winds southwards and has wiped out the south westerlies. 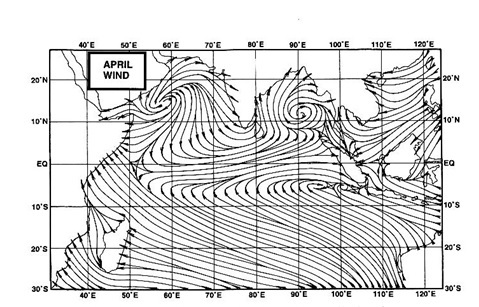 Dry winds in North and Central India,upto 15N, in this map 4. As far as Mumbai is concerned, there has been no rain since the last 13 days, and the day temperature was at 36c today !And the humidity was 54% ! Well, we chase and follow the North -East monsoon winds, which have already reached the eastern shores of the Bay. And we follow the temperatures dropping in North and Central India, and the"October heat" in Mumbai !